Living your dream just got easier. That's because Dupaco offers you simple, cost-effective financing options for new and used boats, RVs, trailers, accessories, and more. Apply online and your loan could be approved within 24- hours*! Choose from several ways to finance or refinance nearly any type of vehicle. 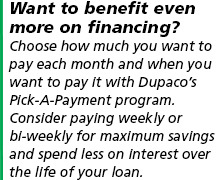 When you bring an existing loan, currently financed with another lender, back home to Dupaco, you'll receive a great Dupaco rate, and a variety of loan terms to choose from, with personalized service you can count on. Dupaco is a not-for-profit credit union with better-than-traditional rates among the area's best. Plus, lower your loan rate through our Cooperative Loan Giveback, which rewards you with rate discounts for your credit union loyalty. See more information under the Rates tab below. Contact our Consumer Loans department at 800-373-7600 / 563-557-7600, extension 202, or visit your nearest branch!